For every wedding, marquees are a fantastic addition to any venue. County Marquees provide wedding marquees throughout the Bromsgrove area, with a range of sizes making us suitable for any number of guests. We have several marquee styles available and will always discuss specific details with our clients to ensure the right style is selected. We will always set up your marquee quickly for any event and in addition to weddings, we can also provide marquee hire for any formal occasions and any type of parties. Marquees are suitable for all types of weathers and our marquees are of the highest quality, making them the perfect feature to create a great atmosphere at any event. Whilst marquees can be used for any event, they are a particularly good feature for all weddings. 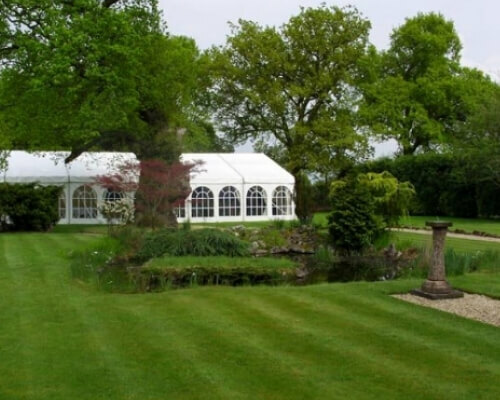 Providing our services in Bromsgrove, marquees can be erected at any venue of any size, whether this is your own garden or a larger stretch of land. Marquees can create a romantic and fun atmosphere for any event, making this the best setting for any wedding. With a lot of customisation available, the style of the marquee is always your own choice. Having this flexibility will allow you to tailor a range of features on the interior and exterior of the marquee, with colour schemes also made to fit in with your wedding. Whilst the white of the marquee will not change, this still provides great style at any event and makes for the perfect backdrop, inside and out, for any photography. The swags we have available allow you to alter colour schemes on the marquee to fit with your wedding. With so much furniture available, County Marquees offer a great option to ensure you have a stylish and tidy venue, with furniture, dance floors and other features already installed. If you have any special requests for other furniture and equipment within the marquee, we can always source these requirements, keeping you fully satisfied. We can always discuss the different styles and colour schemes available in Bromsgrove and tailor every marquee to our client. Marquees are available for any events in the Bromsgrove area whether this is your wedding, birthday or you are celebrating any kind of life event. We aim to provide bespoke marquees of all sizes for all parties and to do this, there are many styles and marquee features we have available with our marquee hire. 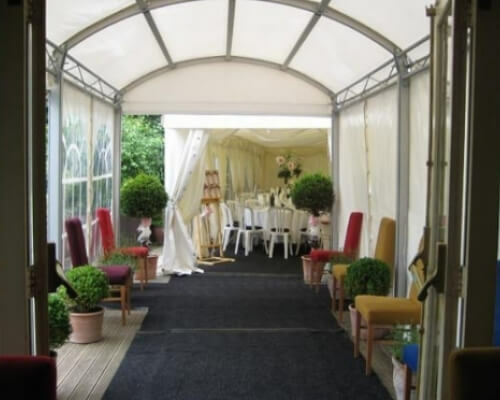 With furniture and equipment, we can always adhere to special requests and provide you with individual furniture within the marquee, meeting all requirements. Our marquees also have lighting styles available, with both night skies and chandeliers to choose from. Our night skies have a range of colour options to affect the mood and tone of every party, whilst adding a fantastic feature to the marquee. Lighting is just one of the options to alter the colour scheme of marquees with swags also available for the interior, roof and sides of marquees. Swags can be draped in a range of colours and we will always discuss which colour you would like in advance. We aim to provide every client with a personal service for wedding marquees, making sure your day is always perfect and that your marquee venue always leaves you fully satisfied. We will strive to meet all expectations you have, altering our marquees to meet your design requirements and having the marquee in great condition for the entire venue. Bromsgrove is a town in the county of Worcestershire, with a population of over 29,000 people. The town of Bromsgrove was first documented as early as the 9th century and in 1841, the Bromsgrove Railway Works were established. As Bromsgrove is an easy area to travel to, located close to the M42 and the A38, we are always thrilled to provide our services in this fantastic location, ensuring all weddings have marquees available to them. Bromsgrove is home to several landmarks and attractions that make it a great area to visit, live and work in. Whether you are a local or a visitor, Bromsgrove is a fantastic area to be in. Just some of the biggest attractions located here include the Atrix, Avoncroft Museum of Historic Buildings, Sanders Park, Tardebigge Locks and Lickey Hills Country Park. These are just some of the many points of interest in Bromsgrove and the surrounding areas and we will always provide marquee hire here. 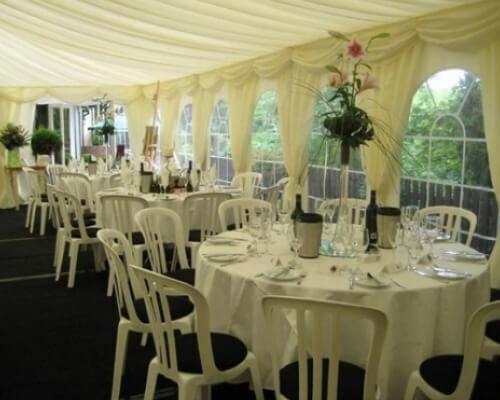 Since our establishment, we have always provided marquee hire throughout the Bromsgrove area. Wedding marquees are always available for our clients and a quick response will always be given in Bromsgrove. We respond to all enquiries quickly and will always discuss your requirements in detail. We aim to be the first choice in all marquee hire throughout the Bromsgrove area, offering a personalise service to all clients. County marquees offer a wide range of marquee styles with both roofing, lighting and colour schemes. Every marquee is fully personalised to you, ensuring we can tailor several different features to fit with the style of your wedding or event in Bromsgrove. 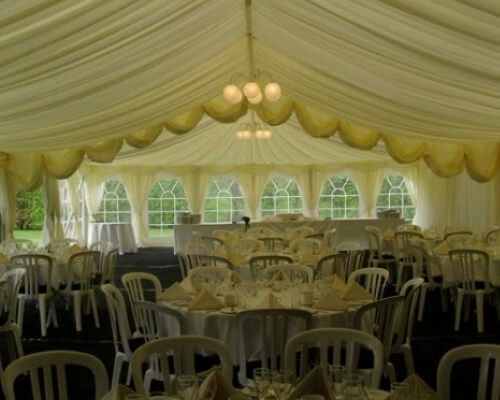 We aim to be the first choice for all clients when requiring marquee hire, meaning you can always depend on us for any sized marquee, no matter how many guests you are catering for. Since being established, we have always given a personal service and will always set up marquees early, organising the entire venue well before any guests arrive. When you arrive at our marquee, all furniture, props and food will be set up, with both the interior and exterior of the wedding marquee in perfect style. Marquees will always make your big day that extra bit special, giving you a perfect venue for entertainment, dancing and decorations. County Marquees will always discuss your requirements well in advance, planning the entire layout and style of the marquee before your event. All customers are well assured that the marquee will be in great condition, with all furniture and features laid out perfectly for you and your guests. Wherever your venue is or if you choose to have marquees in your garden, we can always provide a selection of sizes bespoke to each customer. If you would like to discuss the wedding marquees we have available for hire in the Bromsgrove area, do not hesitate to contact our team. County Marquees can provide advice and information regarding all our marquees, making sure it is always available and setup for your event. Call our team today on 07816648624 or 01214232662 or fill in our contact form to make an enquiry and receive a quick response.